An expressive light resists being ambient, recessed, or merely an accent! Resin impregnated fabric makes the Puff's unique design possible! 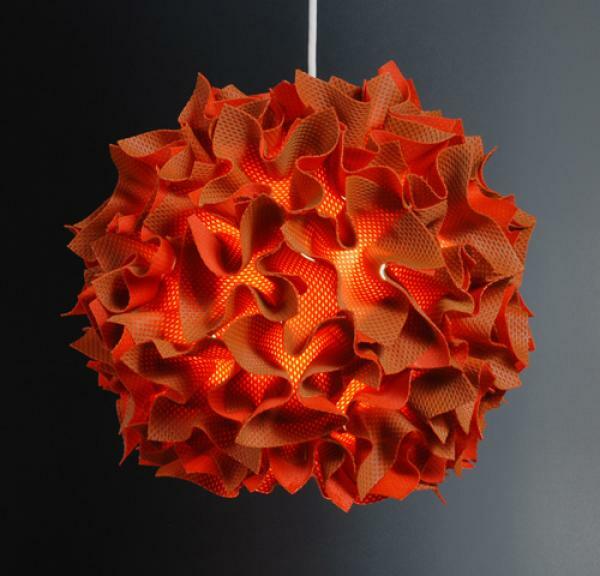 Puff is a sculptural pendant lamp of resin-impregnated fabric arranged into a spherical burst. Uses a 23-watt compact fluorescent bulb (included). Lamp comes with an 8' L cord for hanging. Eco-friendly CFL bulbs included, wattage varies - all hanging hardware and ceiling cap included. The fabric is hard and glass bowl encases the bulb on the interior. There is an opening at the bottom. Professional installation recommended. Custom sizes and shapes available! COM fabric available. Hand made by the designer in the USA. Josh Urso Design is a company dedicated to the design and production of unique furniture. His creations are young, fresh, and entice him to further experiment with materials. This process has lead to the development of his resin-impregnated collection of furniture, lighting, wall panels, and accessories. Receive in 4 - 6 weeks!